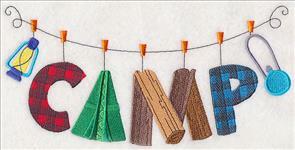 Whether you prefer a cabin, camper, or tent, this week's great outdoors designs are for you. 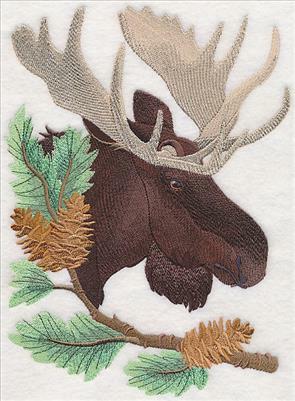 Take a walk in the woods with portraits of forest animals, or stitch a project for your cabin with campfire sayings and samplers. 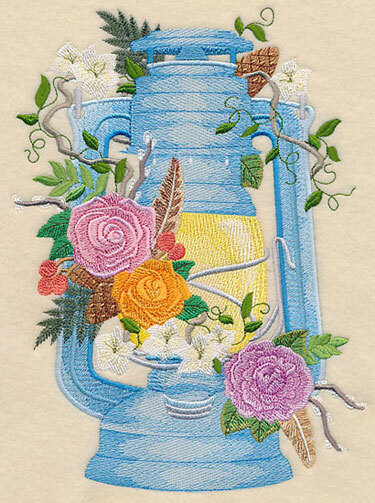 An antique lantern and stunning firefly design will add a chic look to pillows and wall hangings. 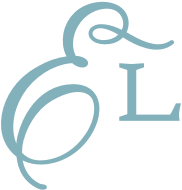 Plus, designs for T-shirts, kitchen gear, and more! 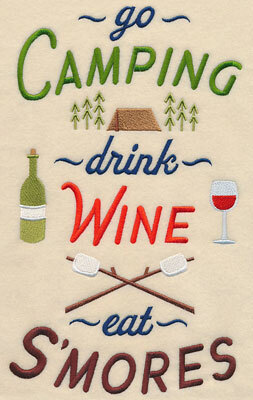 Add a camping clothesline to totes and sweatshirts, or stitch Fred and Sue camping on a quilt. 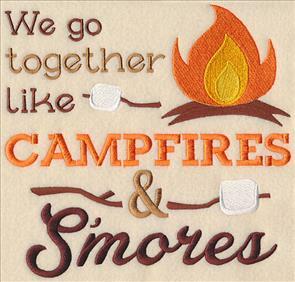 Plus, in-the-hoop s'mores are a tasty way to show off your embroidery skills. 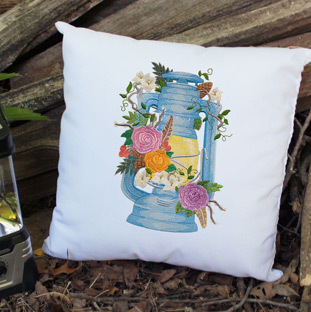 Any nature lover will swoon over a pillow adorned with these camping designs. Stunning wildflowers, pinecones, and greenery bring this antique lantern to life. 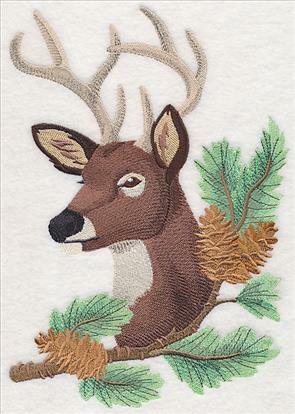 The gorgeous design showcases the beauty of the forest -- terrific for pillows, tote bags, and more. 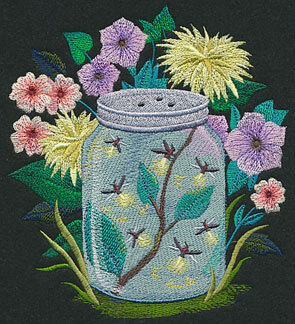 6.90" x 9.25" and 5.82" x 7.80" and 4.86" x 6.52"
A jar of twinkling fireflies lights up the night in this design. 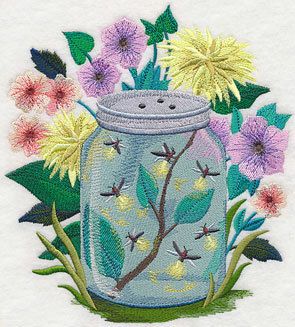 Beautiful stitched on any color of fabric, it's an eye-catching way to add embroidery to your next project. 6.88" x 7.56" and 5.84" x 6.39" and 4.86" x 5.33"
This dark fabric mimics the night sky when adorned with the brilliant firefly design. 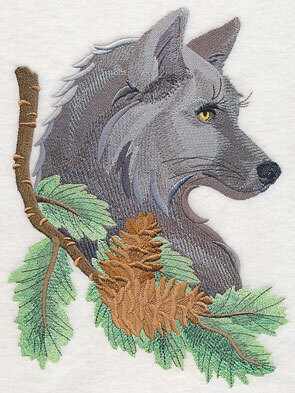 Wild and majestic forest animals come to life on your embroidery projects with these portrait designs. 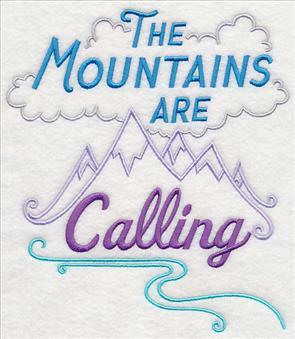 Perfect for tote bags, pillows, and quilts! 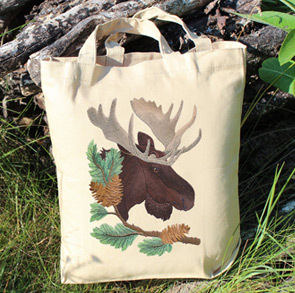 6.62" x 9.44" and 5.47" x 7.80" and 4.82" x 6.87"
Carry your camping gear in style with a tote bag adorned with this moose portrait. 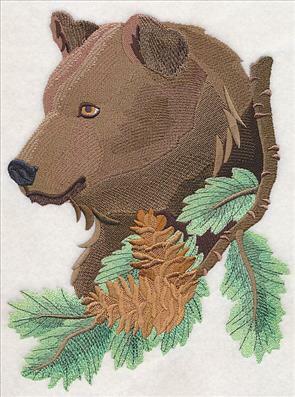 The magnificent beast is portrayed alongside a lush branch to impart the feel of the forest. See how to make a classic tote bag here, or view all of our tote bag projects right here. A wolf and a bear are woodsy additions to the moose and buck portraits above. 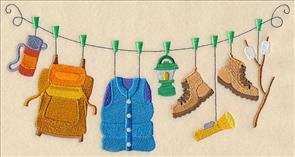 Stitch all four together in a series of framed artwork, on a wall hanging, or a quilt. 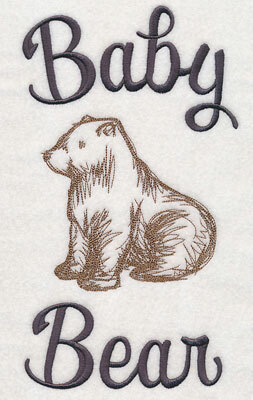 6.89" x 9.19" and 5.84" x 7.78" and 4.88" x 6.50"
A trio of bears -- Papa Bear, Mama Bear, and Baby bear -- are too-cute additions to a wide variety of projects! Use to personalize sweatshirts, T-shirts, pillows, and more! 6.90" x 11.35" and 5.72" x 9.41"
4.75" x 7.81" and 4.17" x 6.86"
6.90" x 10.83" and 5.86" x 9.20"
4.97" x 7.81" and 4.35" x 6.82"
Stitch this little baby bear design in conjunction with the designs above, or use to adorn a onesie, baby quilt, or diaper bag. 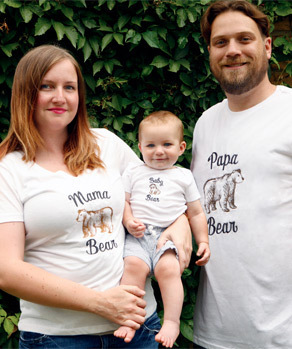 5.86" x 10.26" and 4.88" x 8.55"
4.07" x 7.13" and 3.60" x 6.31"
Stitch shirts for the whole family with these too-cute designs. 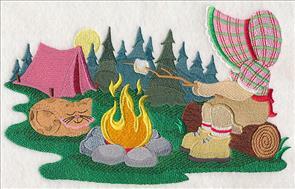 Fisherman Fred and Sunbonnet Sue are classic sewing emblems, and get a sweet camping update in these designs. 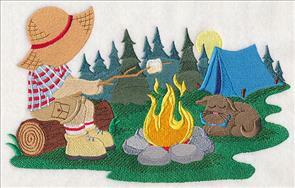 Their furry friends, the Gingham Dog and Calico Cat snooze beside the campfire in these designs. 9.38" x 5.86" and 7.79" x 4.87" and 6.86" x 4.28"
Pillows, tote bags, and T-shirts get a fabulous update thanks to these clothesline designs. 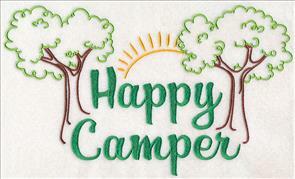 One spells out the word "Camp," while the other features classic camping elements. 9.40" x 4.93" and 7.80" x 4.10" and 6.84" x 3.60"
Give your home up North a rustic look with this woodsy design! 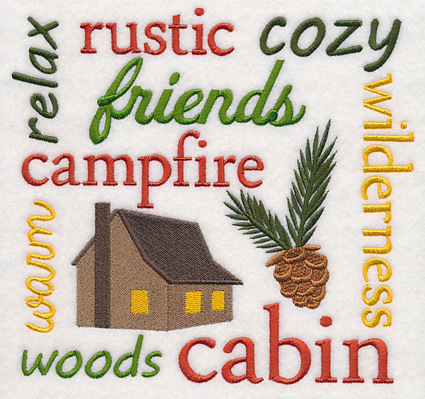 A square with cabin text is perfect for pillows and quilt blocks to update your home away from home. 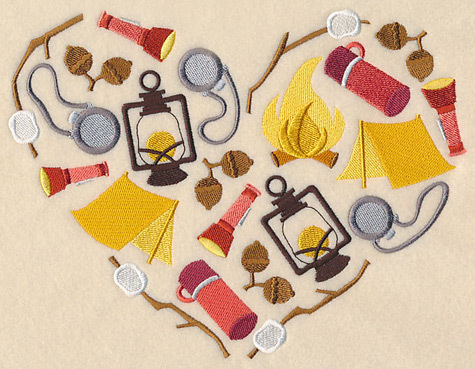 7.79" x 7.19" and 6.98" x 6.44" and 6.34" x 5.86" and 5.26" x 4.86" and 4.18" x 3.86"
This silhouette heart features classic camping elements for all your outdoor gear. 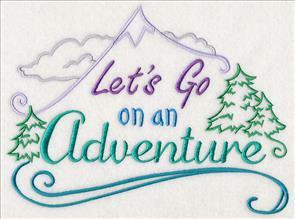 Stitch on sweatshirts, duffel bags, and more! 8.93" x 6.90" and 7.59" x 5.86" and 6.23" x 4.81" and 3.90" x 3.02"
Show your love for a crackling fire with these fiery designs. 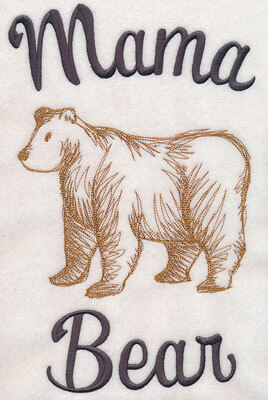 Terrific for tote bags, sweatshirts, pillows, and more! 7.82" x 7.49" and 7.21" x 6.91"
6.11" x 5.86" and 4.87" x 4.66"
7.78" x 6.86" and 6.65" x 5.86"
5.51" x 4.86" and 3.86" x 3.41"
Adorn a dish towel with this too-cute campfire phrase! 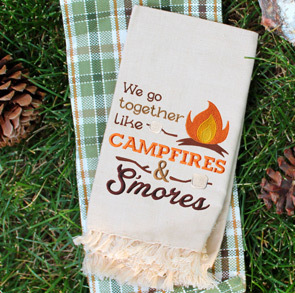 Put together a basket full of s'mores ingredients and this towel for your favorite camper, or use in your own home. Any s'mores lover will fall for these tasty (and toasty!) designs. 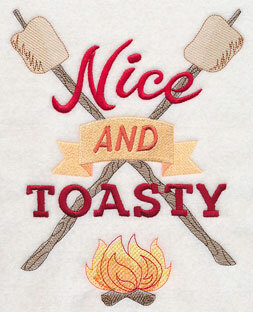 Add the "Nice and Toasty" motif to totes and dish towels, or adorn an apron with the redwork recipe. 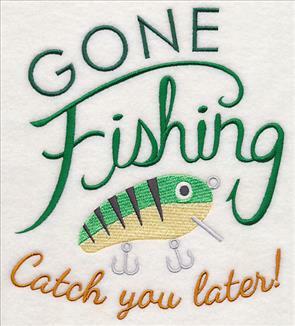 6.90" x 8.78" and 5.85" x 7.44"
6.90" x 7.48" and 5.85" x 6.35"
4.85" x 5.26" and 3.55" x 3.85"
Grab your tents and fishing poles! 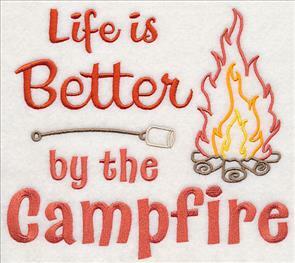 These sayings are eye-catching additions to all your camping necessities, including tent bags, tackle gear, and more. 6.87" x 7.67" and 5.87" x 6.55"
6.85" x 11.48" and 5.62" x 9.41"
4.66" x 7.81" and 4.09" x 6.86"
If your idea of camping involves a set of wheels, this "Home is Where You Roam" design is just for you! 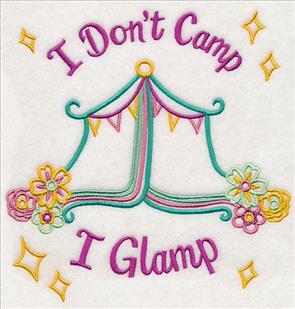 Or, show off the chic side of camping with an "I Don't Camp, I Glamp" motif. 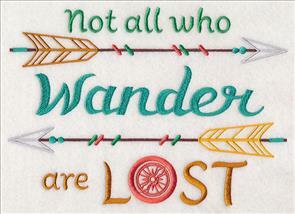 6.85" x 9.08" and 5.85" x 7.76"
7.68" x 7.82" and 6.87" x 7.00"
Embrace your inner adventurer with these free-spirited designs. 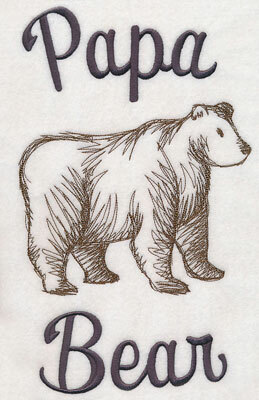 Perfect for T-shirts, sweatshirts, backpacks, and more! 9.63" x 6.91" and 7.80" x 5.60"
11.61" x 6.86" and 9.42" x 5.56"
7.82" x 4.62" and 6.86" x 4.05"
Any outdoorsy individual will love kicking off their next trip with a T-shirt or duffel bag embroidered with either "Let's Go on an Adventure" or "The Mountains Are Calling." 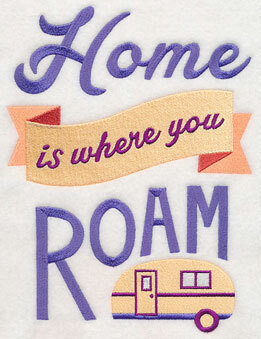 Perfect for the traveler in your family! 9.30" x 6.90" and 7.81" x 5.80"
6.84" x 7.82" and 5.86" x 6.70"
4.84" x 5.54" and 3.38" x 3.90"
There's nothing like sitting around a campfire enjoying a s'more. Now you can enjoy the tasty treat within the warmth of your home with this in-the-hoop design! 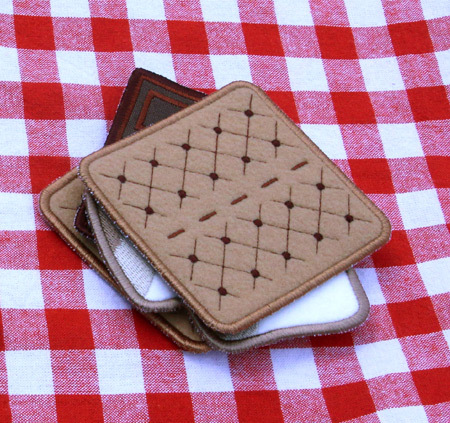 Perfect for any camper or bonfire lover, this in-the-hoop design is made up of two graham crackers, a chocolate bar, and toasted marshmallows. 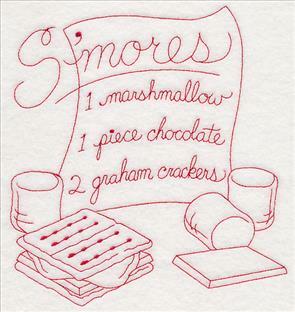 Find the instructions for the in-the-hoop s'mores here. 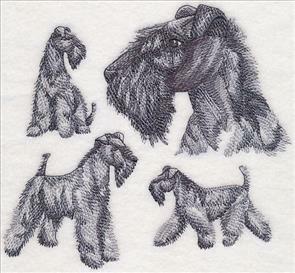 3.77" x 3.93" and 2.80" x 2.92"
Pat is a big fan of the dog breed designs, and requested versions featuring the Kerry Blue Terrier. 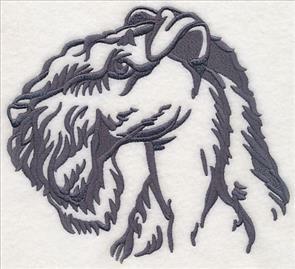 This adorable pup is available in two variations: a sketch design showing the dog in four poses, and a silhouette of the dog's portrait. Thanks for the suggestion, Pat! 6.52" x 5.86" and 5.41" x 4.86" and 3.86" x 3.47"